The length of the sales process has changed, and it is now generally referred to as the “Complex Sales Process.” In the past, a typical sales engagement would generally be a 30-60-90 day process, including time for upfront prospecting. The ‘funnel’ was analyzed by how many engaged prospects were on the go, and where each person was in the 30-60-90 day sales process, so forecasting could be fairly accurate. 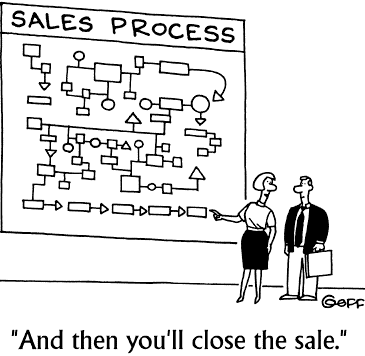 This is NOT what a sales process looks like today. The modern sales process is comprised of the following two distinct stages or cycles, each having their own timelines. From a cold start, there is always a 90-day ramp up period required. This is to allow the time it takes to build a campaign / pipeline from scratch. For example, when we build a sales campaign and target specific companies, we then need to qualify who the decision maker is (which can be a cycle in itself!). We research their digital presence and craft our initial messaging to use in our approach that is specifically designed to find their pain points, business challenges, and goals. A salesperson has to overcome a tremendous amount of inertia with new prospects, because without the sales touch, a prospect will typically not move from the status quo. It is the salesperson’s job to find out what the prospect’s challenges are, gain their agreement that yes, there is a problem, and earn their trust in this product as a solution that will help them. Typically it takes between 6-8 touches through a variety of methods, such as social media, emails, and voicemails, to elicit a response. As you typically cannot call someone every other day to accumulate these 6-8 touches without overwhelming them, this process takes time. Count on at least 6-8 weeks per prospect to gain either a positive response (i.e. yes they do have challenges in this area and would like to have a conversation), a negative response (i.e. finding out they already have a partner or solution for their need), or a referral to an alternate contact person to call to start the cycle over again. When you do the math, you see very quickly that actually obtaining a new customer or sale from scratch within the old 90-day time frame is impossible as there is not enough time for the prospecting cycle of the sales process. Therefore, just the prospecting cycle of the new sales process requires the time that the entire old Sales Process took to complete. Once a new sales prospect has been identified and qualification begun the next step is the discovery stage of the consultative sales process, one of the best known and successful methodologies for B2B sales, especially for the IT and high-tech industries. To summarize, here are the steps in the sales cycle. Discovery / Fact-Finding – This is the most important step in the sales cycle and can take weeks or months, involving several stakeholders in possibly different countries for enterprise-wide decisions. All the information uncovered in the discovery phase will contribute to creating a customized and relevant proposal. It will also help the salesperson to manage objections when they come up. Proposal / Recommendation – To be effective, the proposal must align your products or services with the prospective customers’ areas of challenge and be completely customized (no boilerplate approach here). To be even more effective, the proposal should include additional related challenges that could be solved that the prospective customer may not even have thought of. It should include clear timelines, and the expected ROI if applicable. It is likely that the salesperson will hear objections in this phase, and if so, it may be necessary to go back to the Discovery and Fact Finding phase to dig a little deeper. If everything makes sense, then things will progress to the next step. Negotiations – In the negotiations phase, the salesperson will discuss contractual requirements, creation of the project plan, financial considerations, and other things that are relevant to the product and customer in question. Negotiation allows the salesperson to specifically tailor the proposed solution to the customer’s needs. Implementation – The sales process itself is complete and the new customer is transitioned to implementing their new solution according to the plans created and agreed upon in negotiations. Ask yourself, how long is just the sales stage you currently require for generating new customers? We are no longer in the good ol’ days of 30-60-90 day sales processes. Now, a 6-8 month sales cycle is usually required for a small to mid-sized project, such as creating a mobile strategy or a website redesign. If the project is larger or for an enterprise-level customer, the sales cycle may take up to 18+ months for projects such as CRM and collaboration platforms. This is due to the length of the discovery process and the multiple stakeholders typically involved in projects of this size. Add onto these time frames the prospecting cycle upfront and you begin to see that we are in a very new world of sales. The increased length of the sales process also makes a straight commission arrangement completely inappropriate, due to the length of the new, modern sales process, the heightened level of risk that goes hand-in-hand with lengthy cycles, and the senior level of skill required by the sales team to keep the process moving forward and on track to a successful conclusion. In summary, it is absolutely critical to keep the length of the new sales process in mind when creating your sales forecasts and budgets before new business activities begin to gain agreement and keep everyone on the same page.